This entry was posted on June 3, 2012 at 8:11 pm and is filed under martial arts for kids, Martial arts instruction. You can subscribe via RSS 2.0 feed to this post's comments. Oh, yes, and…do you charge test fees? At Champion Karate West for beginner belt you need 24 classes for each belt. You earn a black stripe after 8, 16 and 24 classes after you demonstrate the belt level techniques. Once you have 24 classes you take a pretest for everything from the beginning through your belt level. Intermediate and advanced belts you need 48 classes to move on. Intermediate and advanced belts have two degrees. We hold our belt test on the first Friday of every month at 6 PM. At the test each student must perform all curriculum from the beginning through his/her belt level. Then the must fight a 2 minute continues round and 3 point fighting round. Students also must perform any Hapkido or Jiu-Jitsu technique ask by myself or other black belt. Thanks for posting, Paul B. Does a student automatically go for the test if they have the 24 classes, or is it by invitation based on the pretest? Each month I evaluate who appears ready for their next rank. I look at the student’s attendance record and consult with the other instructors frequently. Since I often have 25-30 kids on the floor at once, I break into subgroups and assign a different instructor for each group. Brown belts (and occasionally green belt adults and teens) are mentored by black belts and serve as their assistants. I review with each teaching group the focus of the day’s lesson and when a test is scheduled, we review with the students all the material a specific group will need for the upcoming test. During this time, I usually tell the kids that I am looking to see who is ready for their next test. A week or so before the test, I post names on a white board and send email notifications to parents. I give yellow stripe/yellow belt and purple stripe/purple belt tests almost every month because of the volume of students I have. Once I get past purple belt, the testing schedule may go to every two months and so forth as the rank ascends. The tests themselves are given during regularly scheduled classes. I charge $15 per test. The pros of my system allow for individualized assessment and additional instruction for specific students when needed. I also want to reinforce to the student that promotion is based on competence as opposed to simply attendance. The cons are mostly that it is more labor intensive than testing a group simply based on time in rank or preset dates each month. I try to move my testing days around between weekdays and weekends particularly for my beginner students in an effort to make it easier on parents whose child may have conflicts on particular days. Thanks, Terri, for your very detailed reply, & especially the pros and cons. It’s the labor-intensiveness of my similar approach -with similar class sizes – that’s been killing me! Plus, in a limited space, having 30 kids, all ages, some testing and some not – it gets CRAZY noisy and distracting for the younger kids. (& too noisy for my voice; I’m famous for my regular bouts with laryngitis!). So I’ve been leaning toward changing to a different system, with test-only days outside the regular schedule. How many students are in your kids program? We have different systems for our TaeKwonDo students and our Ensodo students. Ensodo students go through an assessment period; there’s no specific test day. TaeKwonDo students are not required to take gradings to train with us, and a significant number opt out. However, you must do formal gradings to progress through the belts. In Chinatown, we hold the grading exams in class time. Elsewhere, there are regular slots, every three months, usually on a Saturday afternoon, open to all our classes. The programme is staggered for more junior grades and higher grades, and normally runs for half a day. Our Dan gradings are different, but for coloured belt gradings we try to make these family events. All the family of students are invited, there are refreshments, demonstrations, gift packs with drinks, sweets, prizes and there are quizes and drawing competitions too. Students can only do the grading with the agreement of their instructor, and we encourage instructors to put forward only students who are ready, and have demonstrated all the requirements in class. Of course, some people still do not do all they need to on the day. We do not “fail” students if they cannot complete the required standards, rather we say that they have not done all that they need to do, and they are asked to complete this in front of a qualified grading examiner in class time, or come to another grading to complete it. You can only grade every three months up to 4th Kup, then the gaps get bigger, and we introduce set theory tests in advance and a required number of attendance hours recorded by the instructors in a book kept by each student. Even before 4th Kup, it’s only a very small percentage indeed (1-2%) who take the gradings every time and never wait till the next one. We have very low training rates with discounts for families, people on low income, and people in the military. We charge about the same as one month’s fees for each grading, but that includes belt and certificate, and there are big discounts offered for families, people on low income, and everyone paying in advance. Also, grading is not compulsory. Hope to see you as a guest at one of our grading days! Thanks, Neil! Having exam day be a family event with more than just testing – that’s something to consider! I am also interested in these students of yours who opt out of grading… I’m not sure that would work within my system. I have had adults train without a commitment to advance through the ranks, but in every case, either their enthusiasm fizzled out, or they changed their mind and decided to earn the ranks. Our system has grown from its humble beginnings into what Didi referred to as “Mega-Tests.” Our students train for 12 weeks, at the end of which is a “regional” type test. Since we teach 200+ students in 8 different schools across the city (not including the 40 or 50 kids in the dojo program) we do not hold the test at any particular school. 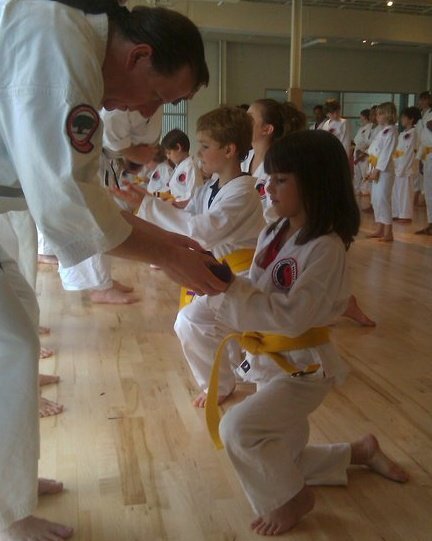 Testing is only done at our Dojo, and it is considered a big deal for the children. We tell our students “Your test may be on Nov 23rd, but you are tested every day!” We ramp up training in the weeks before the test to get them ready for whatever their testing sensei throws at them. We usually test 175+ kids on a Sat. We test from 9am-10, 11am-12, 1pm-2 and 3-4:30. We break the tests up so that we have about 60-75 students at each test. We call on all our sensei and sempai, as well as adult students of all ranks to help out. It is a major dojo event that brings all of us together and provides a great venue for all the parents to watch what their children have learned. Our philosophy about testing is a student’s sensei is not suppose to test him/her. This allows not only for the student to be tested, but our teaching techniques to be critiqued in the process. Students are taken out of their element (their school) and given a sensei they do not know. They are then put through a test that may have up to 60 other students testing around them. This provides a distraction, and their ability to pay attention and perform in a pressure situation is evaluated. We feel this is an important step in developing self confidence in any situation. When it comes to evaluating whether a student is ready for rank we tend to make that call in the last 2 weeks before a test. If a student is not ready then we offer them an “animal test.” We explain this test as a stepping stone to improving their martial arts. The tiger test will help increase speed and power, the crane balance and precision, etc.. We explain that these tests are designed around the katas that black belts learn for their dan ranks. Once all 4 animals are earned they become dragon warriors (we called it that before the movie!) We currently have about 10 dragon warriors. The animal patches they earn are proudly displayed on their left sleeve. We have to remember that these are children. They are growing, learning, and trying to master their bodies. They make mistakes, and this needs to be recognized and forgiven. Their effort and drive needs to be awarded and fostered. We are doing more than just teaching karate, we are developing young adults. Our system has been tweaked over the last 6 years and it works well for us. We advance in rank the students who are ready, give animal tests to those that need more time, and keep nearly all our students happy as they travel the path. That’s great, Smack; you guys are doing a fantastic job. Thanks for posting! I run the children’s program at Fairwood Martial Arts. We have 160 children in our program ranging in age from 6-12, beginners through Brown stripes. We have 20-40 kids per class. We offer testing every month on the last Thursday of every month. In order to test the student must meet three (3) requirements: have enough time in grade, know the techniques and have the right attitude. Not all students are ready to test every month. In the beginning we test students monthly for the first two ranks. For yellow belt, it usually takes 2 months to be ready to test. They are learning their first kata and it takes longer to learn these moves. On occasion we will have a student who comes so frequently and learns the kata quickly and of course he will be allowed to test when he is ready. We always look at each individual. After Purple belt 2-4 months per stripe, After blue belt 3-5 months, and after Green Belt 6-8 months between stripe tests.The students all know these requirements. Test permission slips are handed out 7-10 days prior to testing. These go home to parents. We make certain to tell the students how long they have been in grade and what it will take for them to be ready for their next test. We announce in class who is ready. those students who are “not ready”are told if you are not ready this time, than most likely you will be ready next time. In our dojo we do not believe in setting a child up for failure.For the beginners, yellow through to purple belts, we conduct our tests in the regular class with everyone who is in attendance doing the test.This promotes a very strong healthy atmosphere in the dojo. It also gets all the parents in to watch the students. During promotions I use the opportunity to congratulate the students who have tested and to urge those who didn’t to keep training. I talk to the parents and to the students. To the parents I tell them we are a team. There are 3 of us on this team, the parents have to bring the kids, and they have to listen to them whine, complain and not want to come so they can go play with their friends. it is their job to listen and still bring the kids since they know what they are really learning. I reinforce that the martial arts teaches more than just how to do a front kick. The students are learning how to concentrate when others around them are not; how to focus on a task; how not to quit; how to become strong and fit individuals. These are all elements of success in the work place as well as in school! These are elements that will get them through college and not paying attention to those kids who want to just do drugs or goof off. Then i ask the parents, “So how many of you really want your kids to get a black belt?” Most of them raise their hands. I tell them, ” do not let your kids quit karate”. Listen to them, and say, “but we are still going> Then I talk to the kids, ” How many of you really want to get a black belt? ” They all raise their hands. What is the most important thing you can do to get your belt? “Don’t quit” How long will it take you to get a belt? Answer is ” one day! One day you will have fun in class, You will come back again, and then one day you will be here on the day of your Black belt test.I tell them the instructor are all here to help you any way they can for you to achieve your goals. I put my hand out and say ,everyone shake hands, let’s make an agreement now, we will be here for you, you have to not quit! It usually ends with a very high happy feeling, with parents and students very charged up wanting to do more. I do not believe that everyone needs to be taking a test all together. Students need to learn that if they do not work hard, do not come to class or do not know their techniques than they are not ready for promotion. This is fact of life in everything. Society rewards those who work hard and learn the material. Everyone in the school knows they will get promoted when they can do the work to the best of their ability. No one is graded against another individual. Our intermediate and advanced students are also tested within their class time. We break off into groups with those testing with certain instructors and those not testing with a separate instructor. All Brown belt testing and higher is done on a designated day about every 3-6 months when we have students ready. We ill bring in a guest instructor from out of town to do the testing. This assures a greater standard for our students and connects us with our association. The messages to the parents are very important – worth emphasizing! Thank you for spelling them out for us. Wow sensei Ricki, I really like your comments to the parents and kids! I am going to fold some of that into what we tell our students and parents. I think one of the major factors that influences our “mega tests” is that we want to make testing more special than a regular class. It is not in the same place as class, it is not with their normal teacher, there is a big audience of parents and they get to be tested by accomplished black belts from our dojo (maybe even master Allen!) We promote them in front of all our upper ranks, and along with all the other pomp, it turns out to be a high energy, joyous event that they remember forever! Once our students reach green belt they no longer advance in rank with us. They must start attending teen classes at the dojo. We do, however, encourage them to continue coming to after school classes to assist in teaching. They act as great roll models and often come up with great teaching tips or words of encouragement for the lower ranks.